ABC has given a Season 6 order to Marvel's Agents Of S.H.I.E.L.D. Although its ratings weren't outstanding in Season 5, S.H.I.E.L.D. is a strong DVR gainer and a strong international seller for ABC Studios, as well as a marketing platform for Marvel. The sixth season will consist of just 13 episodes. For a Season 6 announcement clip, CLICK HERE. ABC has previously canceled Marvel's Inhumans. Fox has renewed Gotham for a fifth -- and final -- season, the network has announced. "Gotham will air its fifth and final season, wrapping up this beloved series in a farewell event that will focus on Bruce Wayne's (David Mazouz) transformation into the caped crusader. Gotham is an origin story of the great DC Comics Super-Villains and vigilantes, revealing an entirely new chapter that has never been told. From executive producer/writer Bruno Heller and executive producers Danny Cannon and John Stephens, Gotham follows the rise of Det. James Gordon (Ben McKenzie) through a dangerously corrupt city teetering between good and evil, and chronicles the birth of one of the most popular super heroes of our time." The series also stars Donal Logue, Morena Baccarin, Sean Pertwee, Robin Lord Taylor, Erin Richards, Camren Bicondova, Cory Michael Smith, Jessica Lucas, Chris Chalk, Drew Powell, Alexander Siddig and Crystal Reed. Fox previously renewed Marvel's The Gifted, which will now air Tuesdays at 8 p.m. The network cancelled Lucifer after three seasons. A live-action Doom Patrol series is headed to DC Universe, the publisher's upcoming streaming service. Doom Patrol, based on the seminal superhero team known for its strange heroes and arguably stranger villains, is the latest original live action series to be announced for the upcoming digital service. Produced by Berlanti Productions in association with Warner Bros. Television, Doom Patrol has been given a 13-episode series order and will begin production this year for a 2019 debut on DC Universe. The Doom Patrol television series will be executive produced by Greg Berlanti, Geoff Johns, Jeremy Carver and Sarah Schechter. "Doom Patrol is a re-imagining of one of DC�fs most beloved group of outcast Super Heroes: Robotman, Negative Man, Elasti-Girl and Crazy Jane, led by modern-day mad scientist Dr. Niles Caulder (The Chief). The Doom Patrol's members each suffered horrible accidents that gave them superhuman abilities -- but also left them scarred and disfigured. Traumatized and downtrodden, the team found purpose through The Chief, who brought them together to investigate the weirdest phenomena in existence�\and to protect Earth from what they find. Part support group, part Super Hero team, the Doom Patrol is a band of super-powered freaks who fight for a world that wants nothing to do with them. Picking up after the events of Titans, Doom Patrol will find these reluctant heroes in a place they never expected to be, called to action by none other than Cyborg, who comes to them with a mission hard to refuse, but with a warning that is hard to ignore: their lives will never, ever be the same." For covers and five-page previews of Dynamite Entertainment titles arriving in stores on Wednesday, May 16, click on the cover thumbnails or the links below for the individual titles. * BATTLESTAR GALACTICA VS. BATTLESTAR GALACTICA #5. * JAMES BOND: THE BODY #5. Margot Kidder, best known for playing Lois Lane opposite Christopher Reeve in the Superman movies, has died. She was 69. Kidder died at her home on Sunday, according to Franzen-Davis Funeral Home in Livingston, Montana. Her other credits include Quackser Fortune Has a Cousin in the Bronx, Sisters, The Great Waldo Pepper, The Amityville Horror and Smallville. 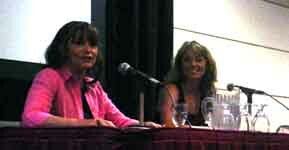 In 2005, Kidder shared the stage with Erica Durance, who played Lois Lane in Smallville, at the Canadian Comic Book Expo. She was asked to compare her Lois with Noel Neill's. "I think there was a huge social change between her Lois and certainly my Lois, which was post 60s," she said. "What I tried to do was make my Lois act like a liberated woman, if you will, around Clark. Then when she was around Superman, she kind of feel apart and turned into a semi-retard and went all goo-goo, as younger woman sometimes tend to fall in love, and I certainly did at that phase of my life." For complete coverage of that panel, CLICK HERE. POWER RANGERS: BOOM! Studios has released images and details from August's concluding chapters of Power Rangers: Shattered Grid story arc. In Saban's Go Go Power Rangers #12, from writer Ryan Parrott and artist Dan Mora, the Rangers team up with an unlikely ally to battle Rita's new monster as the Ranger Slayer inches ever further towards her goal. This issue features a main cover by Dan Mora, with variant covers by Miguel Mercado, Audrey Mok and Natacha Bustos. Then, in Mighty Morphin Power Rangers #30, from writer Kyle Higgins and artist Daniele Di Nicuolo, it's the team-up between every Ranger left standing against the unrivaled power of Drakkon, while a covert team led by Grace embarks on what might be their last mission ever. This issue features a main cover by Jamal Campbell, with variant covers by Jordan Gibson and Joana LaFuente. It comes to a conclusion in Mighty Morphin Power Rangers: Shattered Grid #1, the oversized finale from Higgins and Di Nicuolo that changes everything for the Power Rangers. This issue features a main cover by Campbell, with variants covers by Chris Burnham and Christian Ward. DEADLY CLASS TV: For a behind-the-scene look at Syfy's Deadly Class, based on the Image Comics series, CLICK HERE. BOOM! FIRST LOOKS: For covers and three-page preview of Adventure Time: Beginning Of The End #1, arriving in stores on Wednesday, May 23 from BOOM! Studios, CLICK HERE. Below are solicitations posted for July. Click on the publisher's name for the full listings and look for more listings soon here in The Continuum.